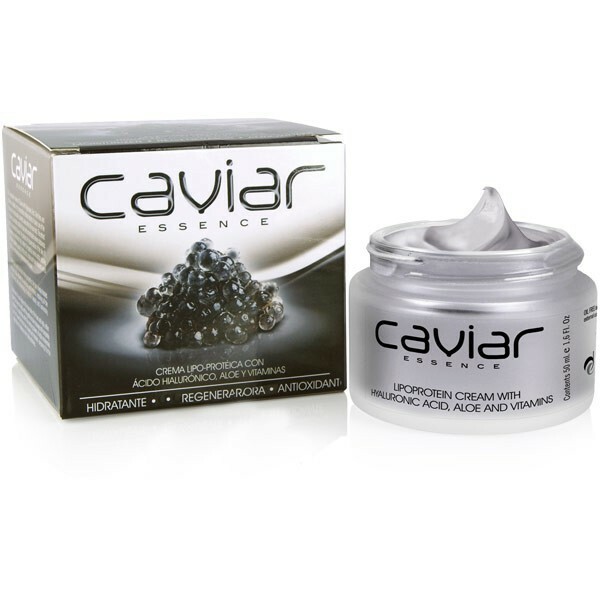 The Regenerating Caviar Essence Cream is a natural treatment to keep facial skin in great condition. It contains the luxury ingredient caviar, which comes from the sea and is rich in amino acids. Amino acids deeply penetrate the skin to repair damage and to fight the signs of aging, such as fine lines and wrinkles. The caviar extract helps to stimulate collagen, leaving the face plumped and smooth, with a lifted appearance. It also improves elasticity to firm up sagging skin, especially around the jaw area. This comforting cream also contains aloe vera, which is known for its calming and soothing properties. It helps to enhance the complexion, so that is feels hydrated, and reduces redness and spots. The Regenerating Caviar Essence Cream should be applied to freshly cleansed skin, in the morning and evening. It should be massaged into the skin in small circular motions, to give added benefits. Aqua (Water), Aloe Barbadensis (Aloe Vera) Leaf Juice*, Cyclopentasiloxane, Glycerin, Cetyl Alcohol, Glyceryl Stearate, Helianthus Annuus (Sunflower) Seed Oil*, Butyrospermum Parkii (Shea) Butter*, Caprylic/Capric Triglyceride, Dimethicone, Propanediol, Ceteth-20, Stearyl Alcohol, C12-15 Alkyl Benzoate, Rosa Moschata (Musk Rose) Seed Oil*, Zea Mays (Corn) Oil*, Caviar Extract, Sodium Hyaluronate, Calcium Pantothenate, Inositol, Retinol, Biotin, Benzophenone-3 (Oxybenzone), BHT, Tocopheryl Acetate, PEG-20 Castor Oil, PEG-60 Hydrogenated Castor Oil, Behenyl Alcohol, Sodium PCA, Dimethiconol, Alcohol denat., Citric Acid, Limonene, Linalool, Alpha-Isomethyl Ionone, Hydroxyisohexyl 3-cyclohexene Carboxaldehyde, Parfum (Fragance), Sodium Gluconate, Phenoxyethanol, Sodium Benzoate, Potassium Sorbate, DMDM Hydantoin, C.I. 77499 (Pigment Black 11), C.I. 77891 (Titanium Dioxide).